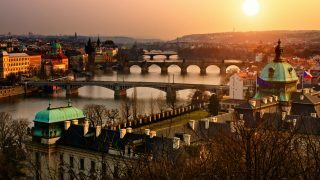 After several years of stagnation at the aftermath of the great financial crisis, residential real estate prices in the Czech Republic began to recover in mid-2014. Meanwhile, the pre-crisis peak levels have been surpassed by more than 10% in real terms, representing the strongest upswing in the CE-region (see chart below). During 2018 price growth decelerated, so far not touching the double digit year-on-year figures observed the year before. 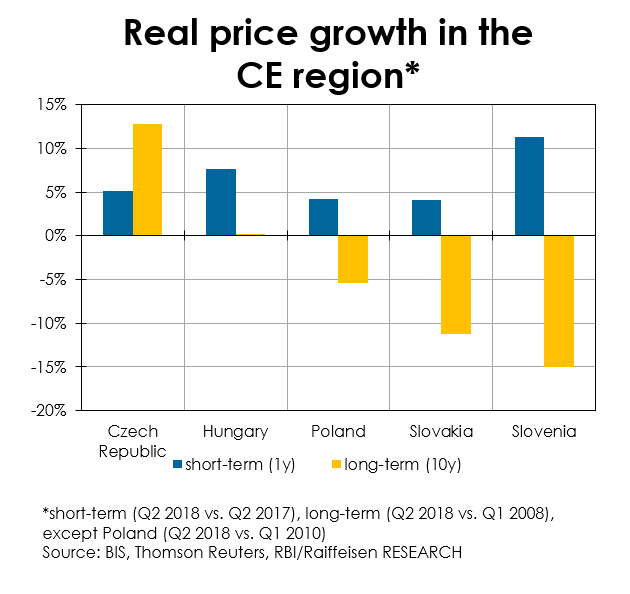 In contrast to rather monocentric property markets like Hungary or Slovakia, the Czech Republic experiences a regionally broad based upturn with cities like Brno or Ostrava showing large price increases as well. 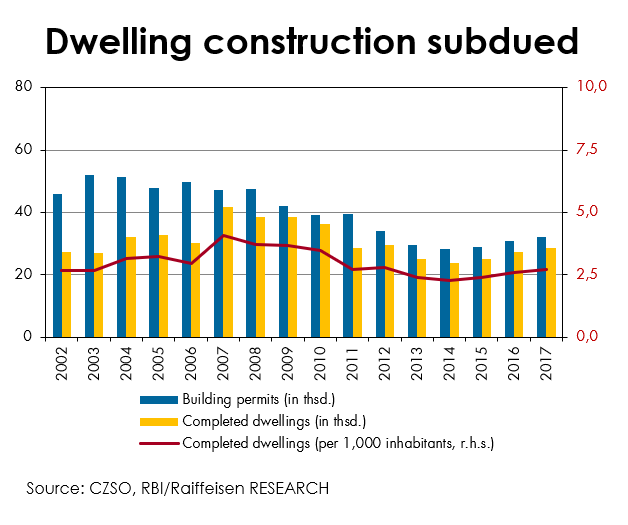 In Prague, average prices per square metre for new dwellings are rapidly approaching the levels seen in some secondary cities in Austria (e.g. Linz, Graz) or Belgium (e.g. Antwerp, Ghent), raising questions about the healthiness of the development. Despite strong real wage growth and record low unemployment – the Czech Republic currently has the lowest jobless rate in the European Union – affordability decreased sharply in recent years. With an average of slightly more than eleven annual gross salaries for a newly built flat of 70sqm (as of 2017, Deloitte), absolute affordability is by far worse than in Poland, Slovakia, Hungary and many other European countries. 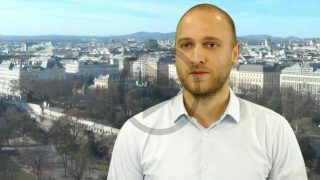 Currently the Czech National Bank (CNB) sees an overvaluation, defined as model-based estimated deviation from macroeconomic fundamentals, of around 14%, which is clearly elevated but not outstanding compared to similar calculations of neighbouring national banks for their respective markets (e.g. Austria, Germany). Looking at residential real estate construction, one of the main drivers of the price growth becomes visible. With particularly high inelasticity of supply, reinforced by current regulations, completion of new dwellings is still insufficient to meet demand. Specifically the process (length, complexity, transparency, etc.) of obtaining a building permit is restrictive. According to the most recent World Bank Doing Business Report, the Czech Republic ranks 156th out of 190 countries in that respect, with only Croatia, Bosnia and Herzegovina and Moldova ranking lower in Europe. 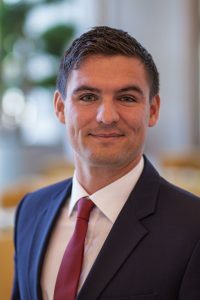 The government addressed the issue with a revision of the “building act” (in force since 1 January 2018), which is expected to improve the conditions for the construction of multi-family dwellings in particular, but regarding the long time span between planning and completion, the supply gap is expected to further support price growth. This is especially pronounced in those regions with high demographic pressure, like Prague and Central Bohemia (Středočeský kraj). Despite regulatory measures taken by supervisory authorities, strong lending dynamics in the Czech housing loan market continue to persist for the moment. As a result, discussions about an increase of systemic risks are on the rise. In the past decade, the ratio from housing loan debt to GDP (2017: 24%) increased by the factor of 2.6x, currently marking the second highest value in the CE-region, after Slovakia (30%). On the positive side, regulatory vigilance appears to be high. On micro-level, the CNB introduced new borrower-related upper limits in October 2018, in order to avoid rising vulnerabilities from household lending. As a recommendation, the debt-service-to-income (DSTI) ratio should not exceed 45% of the applicant’s annual net income and the loan-to-income (LTI) ratio the factor nine in more than 5% of total retail loans secured by residential property. In our opinion this measure has the potential to curb housing loan demand by around a third. However, in contrast to some other countries in the region, the CNB still lacks the opportunity to set legally binding borrower-related limits, thus relying on indirect channels to ensure compliance. Efforts to receive statutory power are still ongoing, which would lead to a better enforceability also for non-banks and foreign mortgage providers. On macro-level, the countercyclical capital buffer (CCyB) has been activated and will further increase to 1.5% (application from 1 July 2019) – one of the highest values in the European Union, forcing banks to hold more equity and thus making lending more costly. As a consequence, borrowers will increasingly shift their attention towards monetary policy actions taken by the CNB. In response to the tightened monetary environment, interest rates on new housing loans already started to increase from the low points seen in November 2016. Since we expect two additional 25 basis points key rate hikes by the CNB for Q1 2019 and one more for Q3 2019, further upward pressure, especially on short-term interest rates, is likely.